The UK's ‘Queen Elizabeth’ class aircraft carriers are the second-largest class of warships in the world. Fresh drinking water can be required for up to 2300 personnel. Aircraft carriers are hugely impressive in size and bring their own challenges. One being to keep their crew supplied with fresh water. This meant having an RO plant requiring minimal maintenance. Two Danfoss APP 8.2 pumps running in parallel, provided the solution with competitive capital costs, low operating costs and reliability. Two new UK aircraft carriers, HMS Queen Elizabeth and HMS Prince of Wales, each rely on three seawater RO desalination plants for fresh water production. 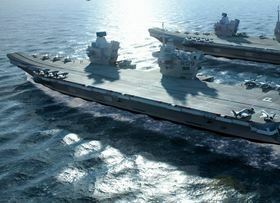 With a displacement of 65,000 tons and length of 280 meters, the Queen Elizabeth class aircraft carriers are the largest warships ever constructed for the UK’s Royal Navy, and the second-largest class of warships in the world. Fresh drinking water is a critical resource for the ship’s company of about 700, and for up to 1600 embarked personnel. It is also indispensable for showers, cooking, dishwashers and general ship husbandry. The new aircraft carrier class was designed from the bottom up for efficiency. In order to reduce running costs, the Aircraft Carrier Alliance and the Royal Navy placed great emphasis on maximizing crew productivity. The number of persons required to run each ship, 700, is exactly the same as their predecessor’s, the Invincible class, which measures just one third in size. Operating a ship three times larger with the same size crew required stringent attention to a vast spectrum of details, and resulted in an unprecedented use of automation and other technological innovations. The competitive capital costs met the demands for low operating costs and reliability to win bid Salt Separation Services won the project, and Shackleton is convinced that the APPs played a key role in evaluations. “There’s no getting around the fact that fewer moving parts equates to less maintenance, reduced manpower hours and fewer worries,” he says.